As shared in the previous post relative to Restorative Yoga poses and the benefits they provide, the one thing to keep in mind is that these poses will help you to restore your inner-self while holding each pose as long as possible. The poses help to move your body into a sort of restful place and state of mind. Keep in mind when moving into each pose slowly and holding the pose for longer periods of time will allow you to become more mindful relative to the physical sensations of each pose. You will also experience the restorative feeling on certain muscles and joints that you have never felt before, while also keeping you more aware of your breath. Many studies have shown that keeping a consistency in your yoga practice will significantly increase serotonin levels and decrease monamine oxidase levels, causing the breakdown of neurotransmitters. As a result, yoga has the potential to decrease depression, stress and anxiety. I personally have experienced a huge difference in my inner peace of mind and an over powering of sensation in all of my joints. These eight poses are a slow starting point that I believe will allow anyone to experience a big difference in how they handle the impacts of stress and the anxiety on a daily basis. Remember to begin with yogic breathing to ensure you are focused on your breath while keeping each breath that you take the same in length or as close as you can through out each pose. This helps also in keeping your poses longer for each pose. Reclining Big Toe Pose: Start by lying on your back with legs extended. As you exhale, bend one knee and hug it into your chest. Loop strap around the arch of your opposite foot, holding one end of the strap in each hand, exhale to extend the foot towards the ceiling, pushing the heel upwards. Keep the knee slightly bent if you feel a stretch without fully straightening the leg. Keep inhaling and exhaling, breathe out, focus to move a little more towards straightening it. Repeat on the other side. Child’s Pose: This pose is used to calm the mind to a restful state. Begin with tabletop position with your wrists directly under your shoulders and knees underneath your hips. As you exhale, sit back onto your heels, while moving your torso in between your thighs and allowing your arms to stretch either on each side facing back with palms down or out in front of you with palms down. 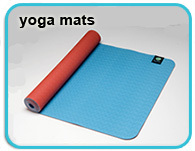 Rest your forehead on the mat. You will feel a stretch along your back, and between your shoulder blades. Reclining Hero Pose: This is a wonderful and effective pose stretching the abdomen, thighs and psoas which are deep in the hip flexors. This is a great reliever of tired legs and overall improves digestion and helping to open the chest. To begin, gently pull your calf muscles outwards with your feet on either side of your buttocks. On the exhale, lower your back towards the floor, leaning back on your hands. If that’s enough of a stretch for you, stay in that position, otherwise you can stretch a little deeper, leaning back onto your forearms and elbows. Again, if that’s enough of a stretch, stay in that position, otherwise you can lay all the way back with your arms by your sides, or extended over your head. (Remember to always listen to your body and if props are needed, please use rolled up blankets to support your knees or your back. Pigeon Pose: This pose is an incredibly powerful hip-stretching pose that can relieve built-up tension and stress from the area. Start in tabletop position with your hands shoulder-distance apart, bring one knee forward, placing it on the mat just behind and outside your hand. Your shin should diagonal with your foot towards your groin, and the inside of the leg should be facing upwards. The back leg and hip should be facing the ground and your back toes to lift the leg and slowly work it backwards so that it is straight on the mat, until you feel a deep stretch along the hip and buttocks muscles of the front leg. Take a few breaths and relax into the pose. If this is enough of a stretch, remain with your hands on the mat and chest up, otherwise you can lower your upper body towards the mat, leaning on to your forearms, or resting your arms above you and placing your forehead on the mat. Take your time in this pose – if you can stay in it for a few minutes, the muscles will relax more and the stretch will be more impactful. Repeat with the other leg. Happy Baby Pose: This pose will help stretch the inner groin and will help to relieve stress and fatigue. Start on your back and inhale, take hold of the soles of your feet with your hands and open your knees wider than your torso. Bring your knees towards your armpits and roll from side to side to stretch and massage your back. You can straighten your legs a little and move them up and down which will help to lengthen the strength. Spinal Twist: This pose works to relieve stress and stiffness in the lower back and hips while also stretching the spine and improving its movement and mobility. Twisting poses like this are also very good for digestion. Start on the back and bend your knees on the inhale. Spread your arms out to either side with palms facing down. As you exhale, slowly drop your knees to one side, twisting from the hips and spine. Ensure that both shoulders stay fixed on the mat and turn your gaze to the opposite side. Your spine and top hip should feel a deep stretch and your chest should feel nice and open. Stay in the pose for at least a couple of minutes and repeat in the other direction. You can also deepen the stretch by crossing your leg over the side your are twisting to. Corpse Pose: This pose is know to be a meditative pose that helps to unwind the body, calming the mind and helping to relieve stress. It can also reduce headaches, fatigue and insomnia, as well as helping to lower blood pressure. To start lay flat on your back letting your feet flop to either side. Open your legs to at least hip-distance apart. Relax your arms on either side of your body with palms facing up. Close your eyes and relax into the pose, initially take long slow breaths and then begin to breath at a regular pace. Clear your mind and rest while focusing on your intention and thanking yourself for making the time to be good to your body. Try these restorative poses daily and you will being to feel the difference in your body. You will be thankful that you took the first step to improving your overall health and well-being. Hope you had a wonderful and blessed Thanksgiving holiday and weekend! !